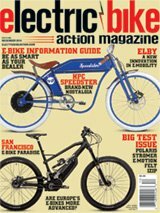 Lapierre have been setting their goals pretty high with each model of e-bike they introduce. Their use of carbon for e-bikes is innovative and well-researched. Today, they introduce their latest Overvolt, the Overvolt AM i Team Carbon. The Team Carbon is Lapierre’s way of raising the bar across the market of what an e-trail bike can be. The frame style is based upon their aluminum-integrated Overvolt AM, which they introduced last year. However, there have been quite a few technical changes to the frame and some drivetrain upgrades, which has produced a different product that sets a standard within the market. By switching to a carbon front triangle, the bike shaved a massive 800 grams in weight. Also worth noting is that the layup has been changed significantly to create a head tube area that has 15 percent more flexibility in it compared to the aluminum version. This gives the bike a more compliant ride and softer feel. The designers arrived at this build by working with Nicolas Vouilloz, who has a legendary attention to detail and focus on product development (not to mention being one of the winningest downhill racers in history). The tube diameters are obviously bigger than a standard bike but integrate the Bosch motor and 500 Wh PowerTube battery extremely well. We were impressed with the lines of the downtube, which when viewed from above give a very slim look. The front triangle is a one-piece monocoque, not a fused or bonded two-piece unit, which allows better strength and flex characteristics. The rear end of the bike is aluminum as carbon was not deemed necessary after extensive testing and prototypes. The rear stays have the ability to be adapted for different tire usage and wheel sizes. Attention to detail is high, and integration for the Bosch system is probably the best we have seen so far. All parts of the system are well-protected and match well with well-formed rubber parts that overlap and protect from mud and dust ingress. 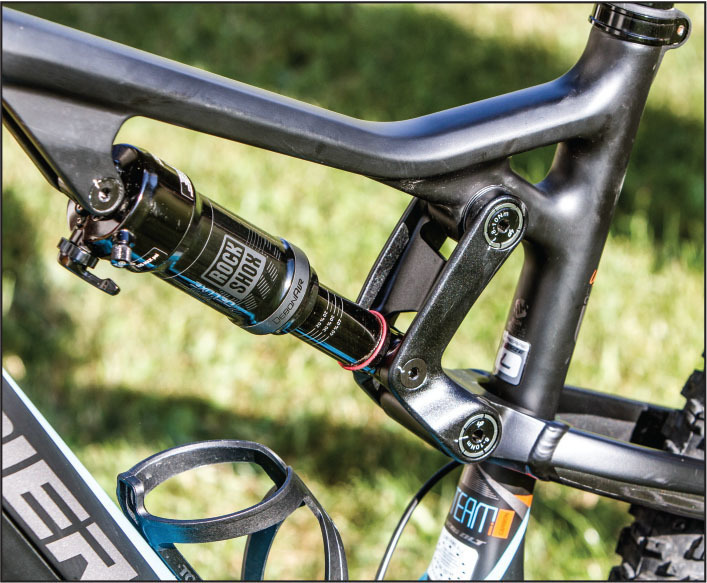 The Overvolt Team Carbon version comes with Rockshox’s high-end suspension units, including a Charger-equipped Pike up front and a Deluxe RT3 Debon air shock, which is metric and mated to their OST+ suspension system. The stock setup was compliant and well-balanced between front and rear. We set the rear shock due to the type of trails we were riding to be quite slow on the rebound. When riding, we found a positive feedback from the trail through the suspension, and the setup gives a quality ride feel and lets the rider know where they are on the trail, especially when it’s rough and the rider needs to know what to do next and sight alone won’t give the answer. Sag is best set at 30 percent if you are intending to push a few limits on the descents. The Pike RCT3 is a great fork with a good tune; however, if you do ride hard, jumping to two or three tokens depending on rider weight is recommended. Lapierre is one of the first brands to specify a 1×12 NX cassette e-bike-adapted drivetrain from SRAM. The cassette is based around their Eagle system and is 11-50t. The shifter is a one-click shifter. You cannot blast through the cassette and damage the chain; you must go one step at a time. The derailleur is an XO Eagle version. This setup works extremely well, is robust and, honestly, the spread of gears is outstanding. There is always a perfect ratio on hand for all terrain types and inclines. Climbing is good. The flex from the frame has removed the sting that one finds in the alloy frames. The new 12-speed SRAM Eagle NX e-bike-ready cassette makes sense. When combined with the Bosch motor in e-MTB mode, especially, we found this setup to be ideal compared to anything else that has gone before. The cassette is a little heavier than their EX version, but the movement of the chain is controlled and quiet. SRAM built the cassette to be compliant with the power in an e-bike. The wheelset and other ancillary components are all carbon. The 27.5+ carbon rims with straight-pull spokes gave us a really precise ride. The combination of stiffness and frame compliance is quite marked on the trail. The use of Maxxis 2.8-inch tires with EXO casings gave us a feeling of security on rough trails without adding extra weight. The bars and stem are the 35mm standard and give a good up-sweep and back-sweep combination, which puts the rider in a “trail” position. Stem length at 45mm is one of our ideal lengths and works well with the reach of the bike. The seatpost and saddle were very functional and comfortable, although we would like a bit more travel (15–20mm) on the seatpost. The SRAM Guide RE brakes gave us controlled, powerful stopping at all times on the trail. It’s a standard requirement to have this level of power now with this type of bike. It’s also worth noting that the Overvolt Carbon is lower in weight than the market average, which Lapierre quote as around 23.5–24 kilograms (51.8–52.9 pounds). Bosch has been absent from our radar for a while with a large amount of other brands’ motors being brought to market. The PowerTube battery standard took a while to be introduced, and now many brands are releasing their interpretations on this battery format. It’s a much cleaner look than the external battery and has become almost ubiquitous on Bosch e-MTBs. Most of the rest of the system remains the same, with a Bosch CX mid-drive and the Purion controller, and includes Eco, Tour, e-MTB and Turbo modes. The e-MTB mode is great to just set it and forget it; it reads your own leg’s torque input and adds to it stelessly from Tour to Turbo. The harder you pedal, the more it gives you. The PowerTube battery on the Lapierre is inserted from the lower part of the downtube with a special quickrelease pin that makes removal easy. Lapierrealso provides a T40 bolt for those who don’t want their battery to be easily removed for various reasons, including opportunists trying to run away with your battery. If you like the Bosch system, like to ride trail and want something that feels precise and has an agile feel, then the Lapierre is going to tick all those boxes. The level of finish is high; the svelte tube profiles, although subtle, take battery integration to a improved state; and the geometry keeps riders heading happily in the right direction of modernity regarding rider position as designers explore the ideals of geometry versus performance or versus consumer demand. Once out, the battery detaches quickly and easily. Our first ride experience took in 6562 feet of climbing and descending, plus 27.28 miles of trail and gravel roads through mountain passes and up steep climbs. The new shifting system from SRAM worked great on the climbs, giving us a cleaner cadence pattern as we rode up. The power delivery was smooth, and grip from the 2.8-inch Maxxis tires was good in the dry, dusty conditions. We were surprised by our ability to hop over almost anything in the way. The Lapierre handles corners well uphill, and we didn’t get that feeling of searching for the balance point on board and trying to keep the front down. The bike remained balanced and just climbed. For a trail bike, it has been one of the best climbers we have ridden. It’s not easy to make an e-trail bike, because no one has really defined what one is, as they all have power. The Lapierre, though, is nippy and responsive. It flies along the trail and reaches terminal velocity quickly. 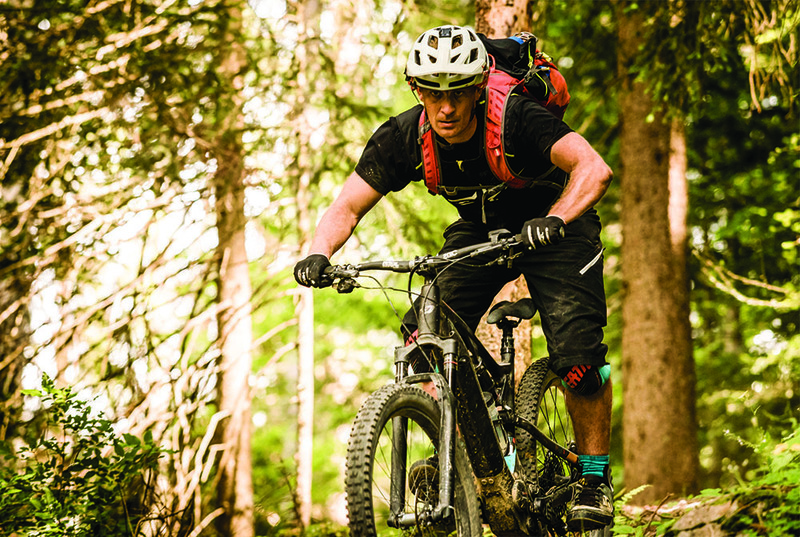 It’s snappy, and the body position of the rider means you can be constantly on the pedals if you want and play with the trail as you ride along or quite comfortably just sit and grind along; either way, the Lapierre is fun. 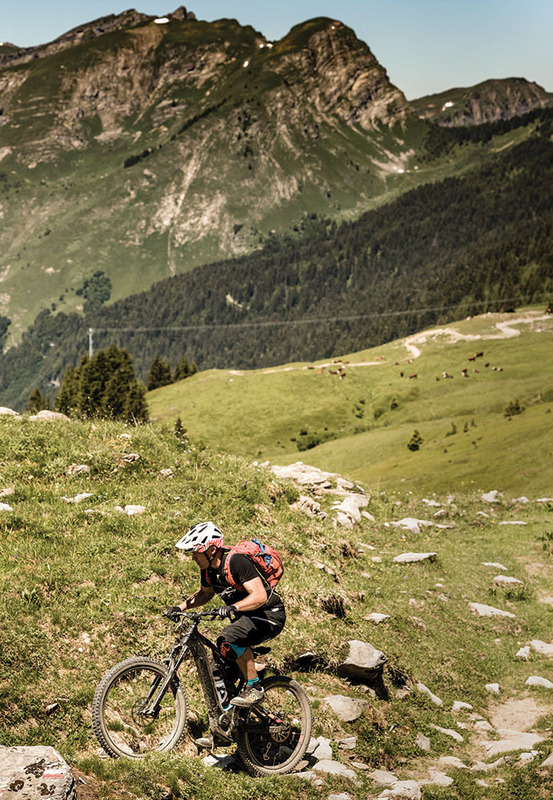 When the trail gets narrow, it’s possible to balance the bike quite easily and keep the flow. We tested the Team Carbon along some very narrow trails with steep drops. The bike is precise enough that we felt we could comfortably sit where we wanted with plenty of safety margin. It is an easy bike to ride. The suspension is positive and snappy, and the bike feels ready for anything that is coming along the trail at you. It gives that feeling of being an all-rounder. Lapierre didn’t try and claim anything about its descending abilities, leaving it up to us as test riders to discover them. We found that the frame is very smooth and compliant compared to the aluminum version we tried last year. The use of carbon wheels gives the bike a feeling of readiness and swiftness on fast, bumpy descents. If you need to react, the bike is going to allow you to, because at no point did we ever feel we would find ourselves in trouble if we overcooked our entrances or exits of trail features. The bike is responsive and can handle everything we threw at it. On faster descents we could feel the bike’s limits, but you have to be going pretty fast, probably beyond the abilities of most of the users who would buy this bike. Cornering is stable and fairly snappy, and it doesn’t drive hard through corners like more aggressive e-bikes we have tested. We felt only on really hard enduro trails one might be wanting for something a bit more capable, but at that point the rider would be too insulated too from the trail and would be the type of rider looking for a more sofa-like experience; in that case, go for a more aggressive bike. Our body position on downhills was great, with enough length on the top tube to not feel like we were unstable. The balance is about right between uphill and downhill feelings in our opinion when looking at the market as a whole. The carbon version in our opinion is actually worth considering. You get a bike that flies and gives a swiftness to the rider where an aluminum bike would feel heavier and less manageable. The wheels and frame layup are part of that overall feel that has been created. It’s worth noting that the price is competitive compared to the rest of the market and also level with non-e-bikes of this level, which don’t have motor and battery technology attached. If you want to ride a lot and like a well-performing bike that feels high end and has a good push up the hill in Turbo mode from the Bosch motor, then the Lapierre should be at the top of your list. It’s a great bike, rides smoothly and is more balanced than many bikes we have tried recently in this category.